We get this question every week “Coach, what kind of boots should I wear for the upcoming GORUCK event”? So we put together this list to help out athletes so they can see what others have used and make the best choice for their feet. Good Luck. There is no magic boot – but a boot that fits your foot and is broken in well – is worth its weight in gold during a long event. Check out this list of boots that have been through the GORUCK event and have performed. Haha, the infamous footwear question. I wore Oakley LSA Water boots . They are minimal-type boots, and they were awesome for ¾ of the event. However, about 36 hours in I was getting some major achilles pain in my left lower calve. I began to limp as the pain intensified. I had packed a spare set of Nike running shoes and switched to those when i saw them on sale (read more). It made a huge difference. John Maris and Cory Rickards also like Oakley LSA Water boots for warm challenges. Dave Merriott uses Nike Sfb Special Field Boots – Only boot I have used so far and they have been through numerous GORUCK events including Heavy, Challenge, Light and most recently HCL. No Blisters, very few hot spots. when they first get wet, they hold in the water and you feel like your feet are swimming but once everything on the boot has soaked in the water they drain quickly after that. 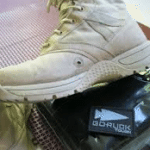 JJ Wellemeyer (GoRuck and Kokoro grad): I wore the Rocky C4T Tactical boot trainers with double socks. A thinner pair as my base socks made of 66% merino wool, and a slightly thicker outer pair. I applied body glide to my feet before I started. Had absolutely zero blisters or foot problems. I changed my boots to sneakers with 1.5 hours only because we had a 15 minute break and I had the luxury of doing so. People who wore minimalist shoes or vibrams five fingers tended to have the most issues. Trey Jones (GoRuck Class 220): In no way would I recommend a minimalist shoes. I used a pair of Inov-8 Terroc 330. They worked fantastic. Not heavy so great while running then perfect for any rough terrain cause it has great traction. Another plus is when we did a 1.5 mile creek walk they drained and dried quickly for the rest of our 10 adventure. Keep in mind you want to keep your feet happy. Laurie Lovvorn (GoRuck and 20X grad): I wore Under Armour UA Valsetz boots for GoRuck and 20X. They are very light and comfortable, although not good on slippery surfaces. I wore Smartwool hiking socks. I used Bodyglide Anti-Chafe Balm on my feet and that helped not get blisters. These boots drain very well and are lightweight and have a good value for the cost. Brad McLeod Atlanta GoRuck Challenge Graduate: I use the New Balance Tactical Bushmaster boots with double socks and inserts. I use body glide all over my feet and had no blisters. The boots drain well and feel great on a long event. These boots are a good value at $90 and have held up well. I also wear those same boots to coach all of the 20X and Kokoro events and go on hikes with the athletes. The New Balance Bushmasters drain well which is important in an event like GoRuck. I never have to worry about my feet during the events. Jeff Brytczuk: I’ve worn New Balance Rappel Mid Hiking Shoe for two. Planning on just wearing my USMC Bates for the next one in June. (NBs finally died, haven’t replaced them. Mike Sharpe (GoRuck graduate): I wore Merrell Chameleon vibrams. For challenge or light just use running shoes. Socks- Darn Tough brand way better than Smartwool. Yes body glide all over! Hew Fung New York City GoRuck Graduate: Completed the NYC GRC this weekend in the Merrell Trail Glove with zero problems. My feet were a little sore by the end, but no worse than expected for 20 miles under load. Paired with Injinji Toesocks and some Bodyglide Anti-Chafe Balm , I had no blisters or hot spots despite water immersion. David Sailor New Hampshire GoRuck graduate: I just did the Manchester, NH GoRuck yesterday. Wore Inov-8 F-Lite 230 Cross-Training Shoe , no problem. I also used BodyGlide on my heels, balls of the feet and top of toes. Had a chance to change socks two times and reapplied each time. I feel the 230’s were the right choice for me. They drained quickly and gave enough support. Mark Sperry GoRuck Graduate: Following on Coach Brad’s repeated advice to go with double socks.. I have been using the Injinji 2.0 Lightweight Toesocks “toe-socks” as the “liner” sock. No blister issues ever. Even after 3 miles under log&ruck in just the socks! Also – “Shoes are a privilege, not a right.” –Cadre Bert Kuntz, to Team One Meatheads, GRC Class 1000. Said advice given as we finished the last few miles in our socks. We like to put Superfeet Green Premium insoles in our boots to help reduce impact and keep our arches from sagging. The inserts are not too expensive and your feet will feel a ton better even from just wearing them around on a normal ruck march. I put them in my boots and can definitely feel the difference. From Jake Brown: I did a Goruck Challenge in Chicago a week ago. I wore some Salomon gore-tex trail running shoes. They worked well. They are lighter than boots and the reduced weight probably lessened fatigue, they drained moderately well after coming out of the water, ankle support was sufficient, and I came out of it without any blisters or hot spots. My feet were a little sore at the end from all the mileage, but it wasn’t anything too bad. I’d wear them again if I did another Challenge but would wear my Asolo Fugitives if I did a Heavy. The specific model was the Salomon Men’s XA Pro 3D Ultra 2 GTX . Best socks for GoRuck would possibly be the ProSoks or Darn Tough Merino Wool Micro Crew Sock . 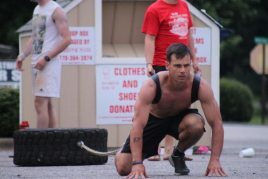 Dave Merriott wore the Columbia Men’s Drainmaker II Water Shoe during his GoRuck event but said they wore out quickly. Question: What are a good boot that is well draining for the GoRuck event? Any of the boots above are great. I like the New Balance Bushmaster as they are inexpensive, get the job done and are well draining. Question: Do you know any athletes that have worn Keen boots for a GoRuck Heavy? We dont personally but we are sure that some have worn Keen boots for the GoRuck Heavy. Check out the list above for boots that have been worn in the past year. Yes. They’re excellent especially if you’re moving over a lot of uneven terrain. They hold they’re grip well and are extremely durable. I’d highly recommend them. Really comfy, durable and they have crazy good grip. That said, I prefer my Garmont T8s. Question: Do you know anyone that wore rocky ct4 for goruck challenge? Yes; check out above JJ wore Rocky CT4’s. Question: Do you have a list of goruck recommended boots ? Yes; check out the boots that we recommend for GoRuck events. Question: What are the best boots for Kokoro? Any of the boots above will do great. The key is to find a lightweight boot that drains well and fits your foot well. Question: Is there any advantage to 6 inch boots vs 8 inch boots. I would look first at how well the boots fit. I would wear a slightly taller boot if I was rucking very distance in rocky terrain with a heavy load. Question: What about the new Hoka boots? Has anyone used those? Answer: We have heard of several athletes that have been using them and we will get an interview for our website. Do you have any experience with Rocky s2v vented boots in a go ruck? SEAL Grinder PT…how are you? I was looking for some advice on boots. I recently started rucking and will be participating in various GoRuck events. For now I’ve singed up for their shorter events but plan on bumping it up in the near future and I would really like to own at least two pairs of boots that are great to ruck in and also drain well. Any suggestions you can offer me? Thanks for your help. I like the New Balance OTB – they are great… but the important thing is to find a good boot that fits your foot well. You could buy an expensive mega tricked out boot only to find it does not fit. So fit is most important first. Hit me up with an email and I will send you a free motivational audio. Glad that the article helps you Carlos. 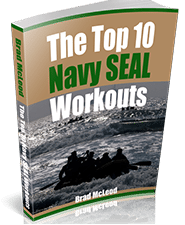 Email brad “at” sealgrinderpt.com and I will send you a free motivational audio. Do you know if the boots not having drain holes will cause major problems? i would try to switch out boots or get a small diameter drill and put a few holes in the bottom. I’m looking for a lightweight boot (uninsulated) that has good arch support. In particular, I have plantar fasciitis in my left foot that I’m able to manage pretty well if I have the right footwear. check out the list of boots above. You will need to see a foot specialist on the plantar issue. I used the Nike SFB Field boots for a recent GORUCK HTL and I really liked them. asic trail runners. I also do normal PT in them as well. They’re both pretty light, but haven’t tested in water. Is a month out enough time to break in another shoe or should I just stick with what I’ve got (I’ve been training 4-6 miles at a time usually moseying the first 1.5 to 2mi then walking for a mile then every .25 mile alternating between mosey/walk). Appreciate any and all advice! Thanks again!! What do you think of lalo amphibian boots? Hope all is well and thanks for the plethora of information ya’ll push out. I have yet to do a GoRuck event but, I am still training. I have hiked some mountainous trails of Arkansas and have just started to ruck myself with a light load of 20#. The boots that I use are the Merrell Mid MOAB Ventilators. My experience with this boot is that the soles are incredible. It is a very comfortable and sturdy piece of footwear. It drains moderately well and has great traction. I like using the Mid style for extra ankle support. It isnt the lightest boot on the market but it is also not noticeably heavy. In my opinion this is a very balanced and long lasting piece of footwear. I hope this helps guys! Enjoy the work and keep hammerin’.